The Killer Rats Cake: Like its illustrious predecessor, The Killer Rats Cake began life as a pattern for a carved pumpkin. 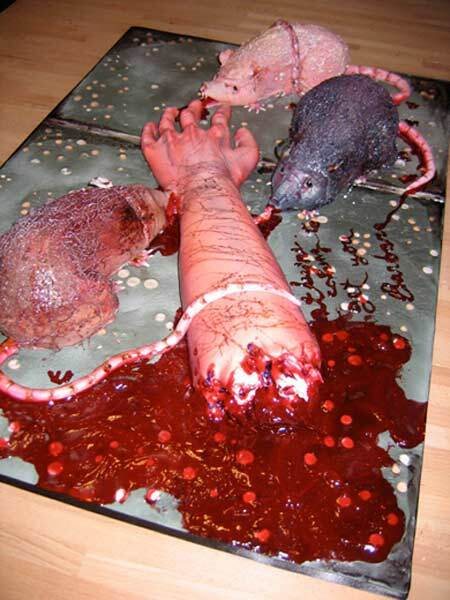 Both the pumpkin and the cake depict a severed human arm being devoured by three large, ugly rats. 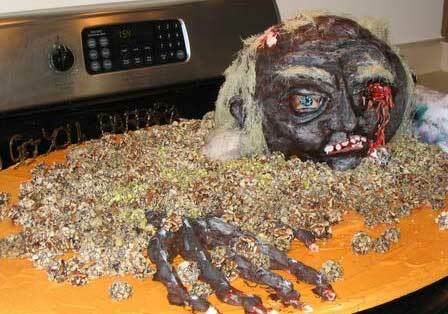 Well, ugly in their cake incarnation, at any rate; they`re sort of cute on the pumpkin. The cake arm was constructed in layers, from the inside out, so that a slice of the cake looked like a cross-section of an arm, complete with ulna, radius, bone marrow, skin, etc. Admittedly, this did not make for a spectacularly dynamic presentation, at least as compared to the cakes that burned or shot blood or secreted bodily fluids, but I think it was just as effective, in its understated fashion.